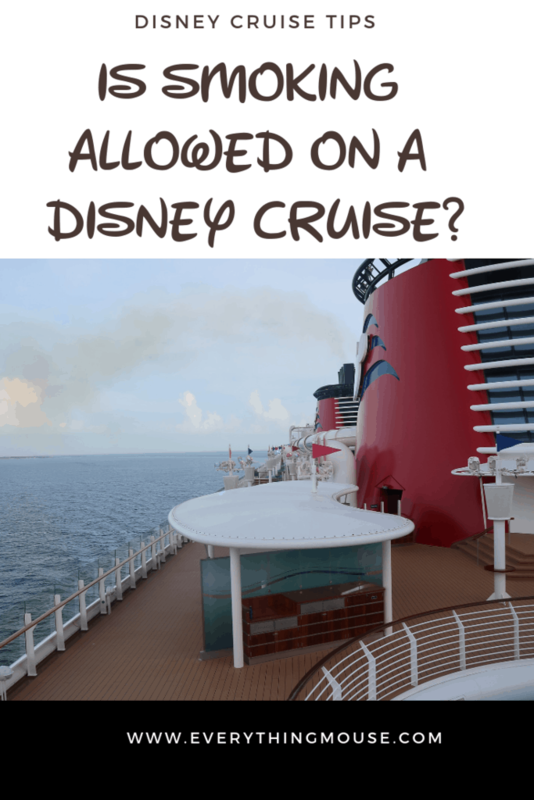 What is the Disney Cruise Smoking Policy? If you are smoker sailing on Disney cruise lines you need to know where smoking is allowed and where it isn’t. Smoking is not permitted in most areas of the Disney ship. You can use a Vape Pen on a Disney cruise but it is treated exactly the same way as cigarette smoking. Each of the ships has its own special areas where smoking is permitted. You are allowed to smoke any time on Deck 9 forward, Portside only. You can use this area at any time of the day to smoke. This area is the adults only area of the Disney Wonder and Magic. 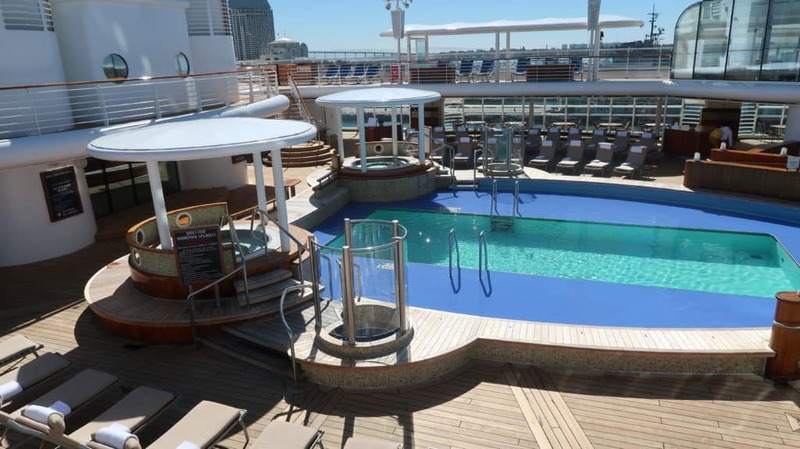 It is at the port side of the pool where there are some tables and chairs available. If you are a non smoker and want to avoid this area, it is easy to do so. As it is outside on deck the smoke doesn’t seem to be too intrusive. You can avoid that area of the ship pretty easily. Between 6pm and 6am you can also smoke on Deck 4 out on the Promenade Deck. 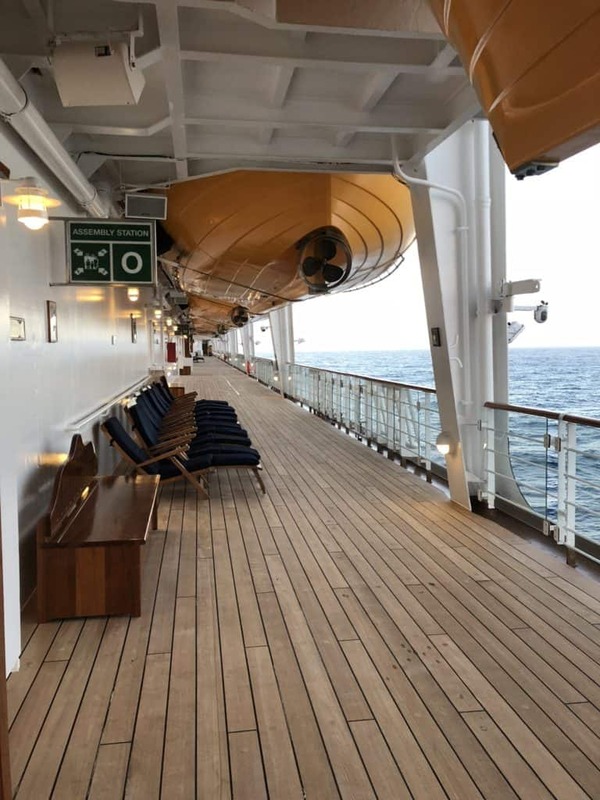 There are plenty of steamer chairs on this deck. Smoking is not permitted in any other areas of the Disney ships including the bars onboard. On the Disney Dream and Fantasy the most popular smoking area seems to be Deck 13 on the Port side of the ship, very close to Currents Bar. This is one of the few areas where I, as a non smoker, have really noticed smoking on the ship. It is a popular area to sit and it does get pretty smoky as you pass as you climb up the stairs on the Port Side to go to Deck 13. Another lesser known area is on Deck 12 aft on the Port side outdoor patio of the Meridian Bar. This area is lesser known as it is between Palo and Remy so doesn’t get as much “traffic” as Deck 13. Smoking is permitted here at any time. There is another patio area on the other side of the bar where smoking is not permitted. Smoking is also allowed on the outside Promenade Deck 4 Port side from 6pm to 6am. Smoking is not allowed on most areas of any Disney Cruise Ship. This includes your stateroom and verandah. If you are caught smoking in your Disney cruise stateroom or balcony you will be charged at $250 cleaning fee. Just don’t do it. Remember that all cigarettes should be disposed of properly. Do not throw cigarettes off the side of the ship. Think no one is stupid enough to do that? Think again, as we have seen it happen! Always have safety in mind. Are you allowed to bring a Vape Pen on a Disney Cruise? Yes you are. However, you have to follow exactly the same restrictions if you want to vape on a Disney cruise as you do if you want to smoke cigarettes. What do you think of the Disney cruise smoking policy?